Lowell McAdam calls Samsung a "dark horse"
Samsung has the potential to be a strong No. 3 in the mobile operating system race, at least in the eyes of Verizon CEO Lowell McAdam. During an investor conference call Friday, he painted the Korean electronics giant as a "dark horse" that could rival Apple iOS and Google Android. 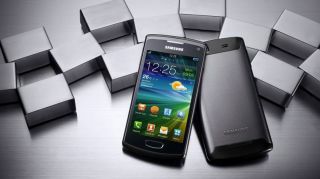 Currently, Samsung's smartphones run either the Android OS or Windows Phone OS. But by marrying its hardware expertise with new software, McAdam said, the company would free itself from relying on partners like Google and Microsoft. The good news for Samsung is that it wouldn't have to start from scratch. The company has a working smartphone OS called Bada, which runs the Samsung Wave 3 and a few other devices available outside of the U.S.
McAdam didn't extend his speculation by saying whether or not he saw Bada leading this "dark horse" candidate to the No. 3 position. However, he did cite the Apple vs. Samsung lawsuit verdict as another reason he believes Samsung could go down this path of independence, according to CNET. Last month, a jury awarded Apple $1.049 billion, ruling that Samsung infringed upon several of the Cupertino company's patents. Appeals and an injunction hearing await. While McAdam referred to Samsung as the "potential elephant in the room," he did take a minute to visit the entire zoo of mobile OS manufacturers. After all, Microsoft and RIM are two Verizon partners still vying for that No. 3 position that Samsung isn't even fully going after yet. "What I like about Microsoft, it's not tied to one piece of hardware," he said of the Windows Phone operating system. So far, Verizon has four phones running either the Windows 7 or 7.5 OS and McAdam said that he's excited about their products. Likewise, he's not counting out RIM's BlackBerry line. Earlier this week, a Verizon executive said the carrier plans to sell BlackBerry 10 sometime this year. It's unclear if Samsung will ever enter the fray with a renewed commitment to Bada or a newer operating system. However, the company has enough electronics (from phones, to tablets, to HDTVs) that could support a mobile OS. Most importantly, Samsung seem to have the backing of at least one top carrier's CEO.